This inspirational true story provides warm, wholesome, family entertainment as JB jets to India and undertakes a talent competition akin to “American Idol” as he searches for cricket players with strong arms. Balls fly sideways, if they fly at all, so American baseball seems like a faraway dream. It does, that is, until two upstart players, Dinesh (Madhur Mittal) and Rinku (Life of Pi’s Suraj Sharma), have the talent JB seeks and the heart to match. 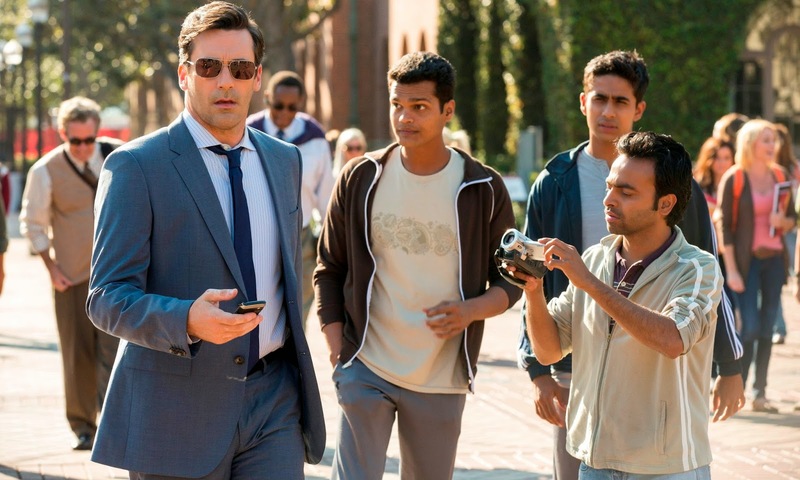 Million Dollar Arm likably blends a fish-out-of-water scenario within a teacher/mentor relationship as JB both coaches the boys and learns from them in turn. One can almost envision the studio pitch, though, in which a producer imagines a film that crossbreeds The Blind Side with Slumdog Millionaire, and the Bollywood infused score by AR Rahman is bound to conjure some memories of the latter film. The film scores some laughs with Alan Arkin mailing in a performance as a curmudgeonly talent scout and finds some sweetness in a romance with Lake Bell that plays a bit too on the nose as Brenda teaches JB how to be a father. Jon Hamm is fine in Sandra Bullock mode, as JB fastidiously uses storytelling and old-school salesmanship to mould Dinesh and Rinku into Peggy Olsons of the major league. The Blind Side, alternatively, is self-contained in its all-Americanness compared to Million Dollar Arm, and the harmlessness of former film doesn’t apply to the latter. JB’s sale of baseball and the reward of fame awkwardly posit the American Dream as a global dream. Million Dollar Arm celebrates American ideology creeping across borders as the dramatization of this true story suggests that the only road to success is an American one paved with dollar bills and TV cameras. That’s a strike, or maybe even a foul. Million Dollar Arm is now available on home video.